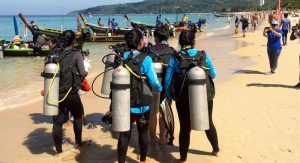 An beach and underwater cleanup over the weekend netted 382kg of garbage from a coral reef off Karon Beach. Leading the cleanup, held on Saturday (Feb 25), was led by Sopon Thongdee, the Bangkok-based Deputy Director-General of Department of Marine and Coastal Resources (DMCR). Joining Mr Sopon was DMCR Phuket Director Watcharin Thinglang and Kasem Sukwaree, director of the DMCR Phuket’s Natural Resources and Environment Office, along with Capt Boworn Phromgaewngam, Deputy Director of the Internal Security Operations Command (ISOC) Phuket branch. Collecting the garbage were local conservationists and volunteers from the local dive community as well as students from Phuket schools who scoured the sand to collect washed-up waste. “Most garbage collected was found near the coral reef off Laem Sai, and most of that garbage was fishing equipment, such as seine nets and ropes,” Mr Sopon said. “Garbage in the sea is a problem that need to be fixed. The national government sees this problem as a national waste problem,” he added. “Thailand is sixth in the world for the most garbage in the sea. More than a million tons of garbage per year is released into the sea in Thailand. For plastic garbage, we cannot identify exactly where it comes from,” Mr Sopon said. “The Ministry of Natural Resources and Environment ordered the DMCR to take responsibility for this problem, so we have launched a ‘sea garbage management’ project under our five year budget for 2017-2021. “The project focuses in tourism areas where there are lots of garbage in the sea that affects the local ecosystem,” Mr Sopon added. The cleanup in Karon on Saturday also follows a mass of floating waste nicknamed “garbage island”, weighing an estimated 100 tons, found floating off Chumphon earlier this month. Marine officials vowed to take action to clean that mess up, too. Stop Trashing Thailand! 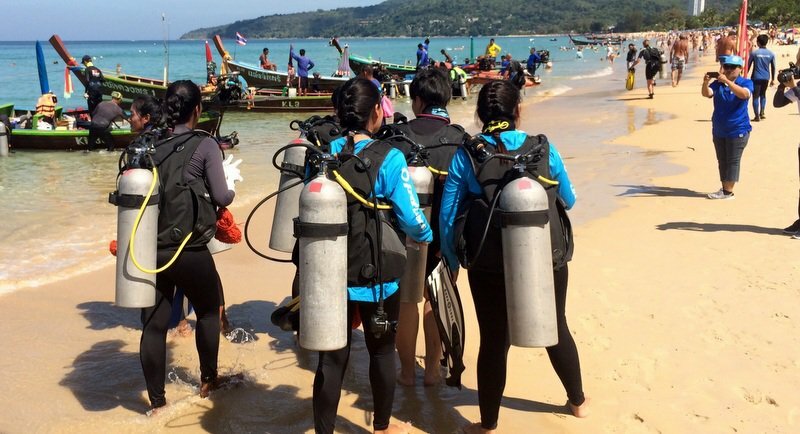 Tourists show the Thais how to pick up litter!